All India Institute of Medical Sciences (AIIMS), Raipur invited applications for recruitment to 100 posts of Junior Residents (JR) under the residency scheme. The candidates eligible for the post can apply in the prescribed format and appear for a Walk-In-Interview on 09 May 2017. 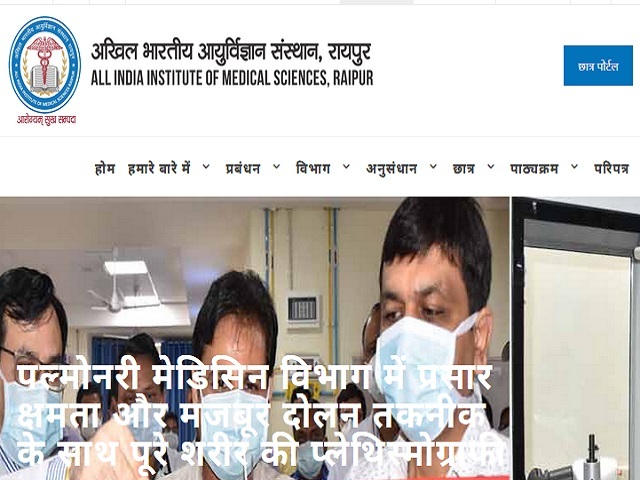 All India Institute of Medical Sciences (AIIMS), Raipur invited applications for recruitment to 100 posts of Junior Residents (JR's) under the residency scheme. The candidates eligible for the post can apply in the prescribed format and appear for a Walk-In-Interview on 09 May 2017.
a. The candidates should have passed MBBS (including completion of Internship) or equivalent degree recognized by MCI. b. Only those candidates who have passed MBBS (including Internship) not earlier than two years before the start date of Junior Residency will be considered. It implies that those who have completed MBBS or equivalent course (including completion of internship) between 08 May 2015 to 09 May 2017 only will be considered. For other details regarding the minimum eligibility criteria please refer to the official notification below. The selections for these posts will be made through the performance in Interviews. The desirous candidates are advised to read the official notification carefully before applying. They will be required to appear for an Interview on 09 May 2017. The timing of the interview will be from 10:00 AM. The interview will be conducted at Committee Room, 1st Floor, Medical College Building, Gate No. 5, AIIMS, Tatibandh, G.E. Road, Raipur (C.G.) - 492099.